The moment you become pregnant, you’ll find the entire world seems to have an opinion or some piece of wisdom you absolutely need to follow. Even popping to the grocery store, you’ll find complete strangers feel the need to pass on their years of advice. While their heart is in the right place, unfortunately this sudden invasion of unwanted advice can start to drive you insane. It’s not just a simple annoyance however. Some pieces of advice offered to new parents isn’t just ineffective, it’s potentially dangerous too (no wonder it seems so crazy!) Here, we’ll look at 10 of the worst pieces of advice parents are often given and why you should avoid following them. 1. The Teething Test – Just Smack Baby’s Gums! This nugget of wisdom is often passed down by the older generation. They’ll insist smacking baby’s gums with a spoon will help you to discover whether or not they are teething. The theory is, if the gums click, there’s a tooth hidden behind them – a sure sign your little one is therefore teething. While this spoon test may help you to see whether or not your little one is teething, it’s guaranteed to cause baby a lot of upset and potentially pain! There are much easier ways to discover whether your baby is teething, none of which include potentially harming or unsettling your little one. Top signs to look out for include constant drooling, raw-looking gums and constant irritability. You’ll also be able to feel the gums using your finger, to see whether any teeth are hiding behind. So, no spoon or hitting of the gums needed! While we’re on the subject of bad teething advice, a very common piece of advice is to rub alcohol on baby’s gums to soothe them. This is absolutely false and alcohol should never be used to try and soothe baby’s sore gums. Diaper rash can be common in infants, so it’s understandable there’s a lot of advice given on how to eliminate it. However, one piece of advice you’ll want to avoid is to throw the diapers away and let baby let it all hang out. Now, obviously if they aren’t wearing diapers, they’re unlikely to get diaper rash. However, you’re also going to spend the majority of your time cleaning up a lot of unpleasant disasters. With nowhere for waste to go, you’ll end up doing a lot more washing, and getting significantly dirty. There are a lot of remedies available to help with diaper rash, so don’t be tempted to try the natural test! Another common piece of advice you’ll want to avoid is to be stricter with your little one because they’re actually manipulating you. As an adult, it’s easier and natural to look at situations from an adult perspective. There’s a lot of advice floating around about how important it is to create a routine for baby and stick to it. However, this usually refers to older babies. Until babies reach a certain age, they are unable to understand a routine. They’re also incapable of being manipulative. So, leaving them to “cry it out” or giving them tough love before the age of 2-4 months isn’t going to have the effect you think it will. Don’t feel bad if you’ve actually done this however. It is a very common misconception that babies can be manipulative and you need to stick to your guns right from day one. You’re definitely not alone if you’ve tried the tough love approach. The recommendation to not use a car seat is one of the most dangerous pieces of parenting advice you’ll come across. Many people swear it couldn’t be safer to carry your little one on your lap rather than a car seat. However, not only is it potentially very dangerous to carry baby on your lap while you travel, it’s also against the law – and rightfully so. The laws regarding infant car seats are there for a reason. It’s also really important to ensure you’re using a proper fitted car seat and that baby is strapped in really well before you set off. People who recommend not using a car seat are generally those who grew up in a different era where car seats weren’t overly popular or legally required. The truth is, placing baby into a car seat could literally mean the difference between life or death if you were to be involved in an accident. There’s been a huge increase in the number of parents opting for “positive parenting” techniques. While many of the methods used during positive parenting can be extremely effective, some are a little more questionable. One in particular is the avoidance of the word “no”. It’s said that if you use the word “no” a lot to your little one, they’ll start to repeat it over and over again once they reach the toddler stage. This can understandably be quite annoying, so it’s understandable it may seem better to avoid using it completely. That is of course, until your little one starts to do something potentially dangerous. Say for example, they’re about to stick their tiny fingers into an electrical socket. Are you going to have the calm reserve to say “Hang on baby, you really don’t want to do that”? No. Sometimes, the word “no” is absolutely needed and it’s worth the potential annoyance you may experience once your baby reaches the toddler stage. When your little one is older, you can start to have more conversations about why things are right and wrong, but until they have a good grasp of the English language, “no” is an effective way to ensure that they learn what is and isn’t acceptable. There seems to be a common misconception that swaddling can be harmful to your little one. The most bizarre reason you’ll be given to avoid swaddling baby is that it can lead to deformities of the arms and legs. Now, like most of the bad advice listed here, there is some logic behind it. As swaddling does involve wrapping baby up tightly so they can barely move, it’s safe to assume it could cause issues with circulation and cause the limbs to grow abnormally. However, unless you’re planning on leaving baby swaddled tightly for the majority of the day, it’s actually very unlikely it’s going to cause any issues and it certainly won’t lead to any deformities. In fact, swaddling can be one of the best things you do for your baby. It really helps to comfort them and combat the natural falling sensation babies develop. However, it is important that you learn how to do it correctly in order to avoid any potential problems. While it may be a very good observation, being told you need to relax more can have the total opposite effect. It’s also impossible to fully relax when you have a baby to look after. The worst, is when you’re compared to other moms who appear to be much more relaxed than you. Don’t let these comparisons get you down. Yes, Deborah may be much more put together because maybe she has a little more help? Or maybe she’s just very good at hiding the pent-up fear and stress that naturally comes with parenthood? There’s also the fact each child is different and Deborah may be lucky enough to have a baby who sleeps all the way through the night – yes these rare babies do exist! So, the next time somebody tells you to relax more, don’t worry if you can’t do it. Practically every new parent spends the majority of their time one step behind a complete nervous breakdown! Ok, so this is another nugget of wisdom that’s often passed along. Very similar to the “baby is manipulating you” advice, it’s impossible to spoil a baby with cuddles. In fact, it’s absolutely recommended you give your little one as many cuddle as you want. Bonding with baby is essential in the early days and one of the most effective ways to do this is through via skin-to-skin contact. It’s how they know they are loved. So, if you hold back on the cuddles, you could find you don’t bond with your baby as much and this in turn will lead to a whole range of even worse issues later down the line. Many parents have been told by well-meaning strangers, that if their little one wakes up in the night, only give them water. The reason? Babies don’t like water, so if that’s all they are given during the night, they’ll eventually stop waking up for a feed. You can’t fault the logic with this one, but the truth is, giving water to a baby under the age of six months old is not a good idea. Experts always say to avoid feeding water, or anything other than milk or formula to babies under the age of six months old. There’s also the fact it doesn’t quite work the way it’s supposed to. Your baby will still be hungry and they’re also unable to link to the fact that they’re only getting water and not milk. Remember – babies can’t think like adults and they’re purely driven by their instincts. Another bizarre, and bordering on cruel, piece of parenting advice you may have come across is that if your baby bites you, you should bite your baby back. Babies and toddlers do go through a phase of biting. Babies largely do it when they’re teething as they get a feel for their new abilities. It’s completely natural, rather than a bad habit. Even with toddlers who know biting is wrong, you should never resort to biting them back. It may sound obvious, but when you’re told to give something a try and nothing else has worked, it can be tempting to give these bad pieces of parenting advice a try. If you have followed some of them, don’t feel bad about it. It’s difficult to establish which pieces of advice you should and shouldn’t be following. Almost all of us have been given some terrible advice at one point or another, and we want to hear yours. Share the worst piece of parenting advice anyone’s ever given you in the comments below – it could really help someone out! Wow, some of these pieces of advice are really, excuse my words, downright cruel. Bite your child back? or smack their gums? What’s wrong with people. I would never ever follow those two that’s for sure. My general saying about parenting is that the parent knows what’s best for their child. There are too many random people that try to advise you about parenting when they don’t even have a child themselves. Knowing or reading things about parenting and actual practical parenting is completely different. I know that many try to help giving out tips but avoid doing it. I want to raise my child the way I see fit, I don’t need somebody telling me not to cuddle my boy too much and so on. You did a good job explaining why these things shouldn’t be done. I really do hope future or current parents read all of the tips and take them into deep consideration. That’s true, Jane. Parents should read tips and see if it fits their parenting styles because they know their kids better, and are the best people to know how to raise their kids. All kids are different and require different treatments. If you have three kids, that means you will deal with three personalities. This was fun (and very interesting/informative!) to read. I’d heard some of them, but not all. I’ve never heard of the “gum-smacking”… how cruel! If it’s time for teeth to come in, it’s teething, simple as that, and “proving” it doesn’t make sense. I always got upset when I heard about the alchohol, but I know that a lot of people do it. There are much better and safer ways to lessen the pain. Parents can’t help but spoil their baby at times. I guess most parents would be guilty of this. As long as it’s in moderation, I’m sure it would be fine because anything that is too much is a bad thing. As for some of the tips here, yes, I do find them downright cruel, too. I don’t think any sane parent would do them, haha. Yes, I agree that there are so many advice for parents, no matter you are a mom-to-be or already a mom of 3 kids. There are some advice I have not heard before, such as bite them back, teething test, throw diapers away. Frankly speaking, these are quite ridiculous to me. I just recently shared a quote on Facebook which is “We will never spoil a baby by giving him too much love”, hence I always do not understand not cuddling the baby even though he cries. That’s a sign he needs us, but not manipulates us. I just think as a new parent, we really need to know what kind of parent we want to be, instead of just listen to others, even the “experienced parents”. I have seen some friends struggling as they get different advice from different parents. Parents, new parents especially, should take advises in stride because not everything will apply to them or to their child. As I often say, every child is different and each requires a different approach. LOL, I do find some of the advises here ridiculous as well. You’re right guys! Some of these are down right cruel. I could just imagine the baby’s pain when his/her gum is smacked. I don’t think any sane parent would do such a thing, haha. When we had a baby, a lot of people gave us advice on various things. Some of their ideas worked and some did not. “In order to avoid diaper rash, do not use disposable diapers, instead use cloth diapers,” said my sister, a mother of two kids. We tried and it worked. Now we had more work, had to clean cloth diapers, but using cloth diapers also saved money on disposable diapers. Another advice we received regarding the control of diaper rashes is using powder before you put on diapers. This also worked. Yes, vinaya, not everything other parents advice will work for you. As you said, some work while some didn’t. I’m sure by now you know which works best for your baby. Using cloth diapers can be a hassle, however, the fact that it lessens the possibility of your baby getting rashes is worth all the hassle in the world. Rashes are very irritating so when you use cloth diapers on your baby, you’re sparing him/her of the irritation plus you get savings by not buying disposable diapers. Powder is also good, but not if a baby has asthma. I have more to add regarding being manipulated by the child. My child is just one year old, yet he manipulates me. He does not know what he is doing, however, his behavior and temperaments are manipulations. I have a deadline to meet, I am seriously working. My child takes the support of the sofa leg and stands up, then he begins to yell, he will continue to yell until I look at him and smile. This is just one example. There are times when we cannot get away from manupulation. Yes, that’s true. A child has actions that manipulate adults, without the child knowing that he/she is manipulating his parents. That is why it is important that adults teach a child the right ways so he/she will not end up becoming a problem child in the future. 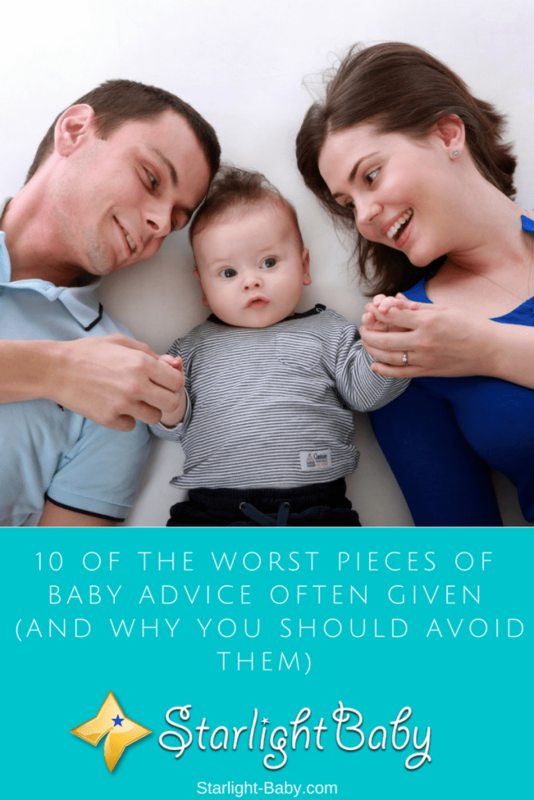 I couldn’t help it laughing at most of these horrible advice given to most new parents especially the number 2 option of throwing the diapers away to avoid diaper rash and the option 10 of biting the baby back. Well, I don’t need to plead with the parent not to throw away the diaper, only the stress, mess and inconveniences pooping and urinating of the the baby in a day is going to be enough to get the parent wear them the diaper back. On the crazy advice on biting the baby back, I would simply see the giver of such advice as a sadist and as such won’t regards his or her words as anything. Yes, some of the advice mentioned are outrageous, some downright cruel like #1. Who in their right minds would do such a cruel thing to a baby?! I would say it’s barbaric. Makes me wonder if ancient people practiced it, haha. It’s definitely more than barbaric, it’s absolutely inhuman. Sometimes I wonder how people seat, think and conceive such horrible way to treat a harmless innocent baby. It’s as if they are dishing out punishment to the baby like they never wished the baby to be born in the first instance. Yes, you’re right. These “barbaric” ways make it seem like the people who practiced them never wanted any babies at all. It’s quite ridiculous that such advices were being given to pregnant and nursing mothers. I mean advising a nursing mother not to use the word ‘no’ to her baby sounds quite odd, I mean there are situations, like you said, parents should be that strict with the baby to pass a useful message to the baby that what they’re trying to do ain’t the right way to go about it. Also, situations such as not using the baby car seat belt is not only dangerous for the baby when the mom is carrying he/she on a travel, but a potential risk to the mother as well. I’m elated to learn about these wrongs advises the older generation are trying to pass on to us for it is going to help me understand how to handle different kind of scenarios when I have a baby with my fiance. Advice is free and is doled out in plenty. If you are a new parent, you’ve had it. Here are 5 such wrong advices that can drive you crazy!